If you use Facebook pixel to track your website visitors' actions there is a way to get data from tracked conversions directly into Databox. Metrics can be used to analyze the effectiveness of your conversion funnel and to calculate your return on ad investment. It is easy to create a custom metric using Facebook Ads Query Builder and use it on your Databoard. Choose "Data Manager" in the top menu bar and then in the submenu select "Query Builder"
Create a new Query by clicking on a green "+ New query" button. You can also open a Query Builder directly from Databox Editor by clicking on "+ Create custom metric" text below Metric dropdown in the right sidebar in Databox Editor. Select Actions as a metric and then select your Pixel from Action Type drop-down. Optional you can select a Dimension by which you want to sort Pixel actions value (we selected Campaign for this example). 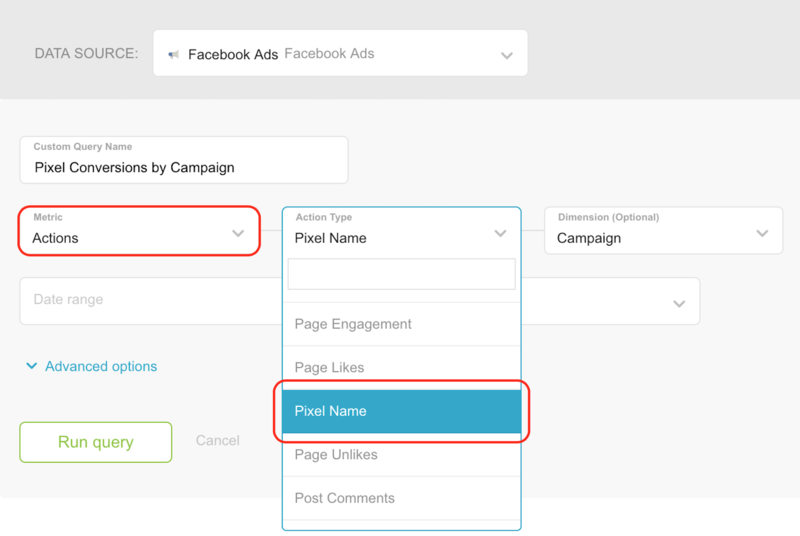 Check here how to filter metrics by specific Dimension using Facebook Ads Query Builder.